Today's Waif is well worth waiting for. This one is special - VERY special. And no one deserves a home more than this guy. "Hello, ladies! And, gents, of course (but, let's be honest, I'm a ladies man). I'm a sophisticated bachelor who loves the simple things in life like fine food, toy mice, and walks through the house. I'm the George Clooney of cats; I just get better with age. The white specks that appear on my fur are simply reminders of the wisdom of years past. I'm going to level with you here; I'm tired of the bachelor life (don't tell my buddies). I'm ready to settle down and be in a committed relationship. I want the security of knowing my significant other will always be there for me, tuna in hand, waiting. While I do want the joys of a committed relationship, I am open to sharing. I've shared my living quarters with other like-minded felines and canines, and feel good about my ability to go with the flow. I'm a clean fellow - I know where the litter box is, and I know how to use it. While the younger generation is playing with string and light reflections, I'll be sitting with you while you read poetry at the window - nodding my head and purring in satisfaction. Have I caught your eye yet? Of course I have....take that pretty little hand of yours and dial this number, 816-986-4426, to set up a date with me. Flowers and chocolates? Psh, I'll give you purrs and head butting. Talk to you soon, doll (or....sir). 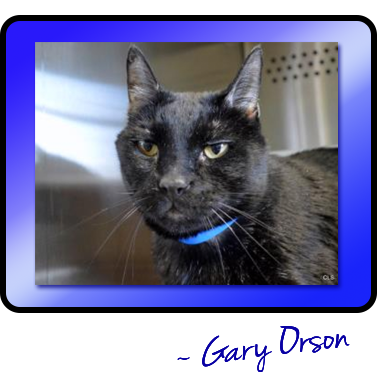 Gary's available at Allie's Alma Mater, Wayside Waifs. 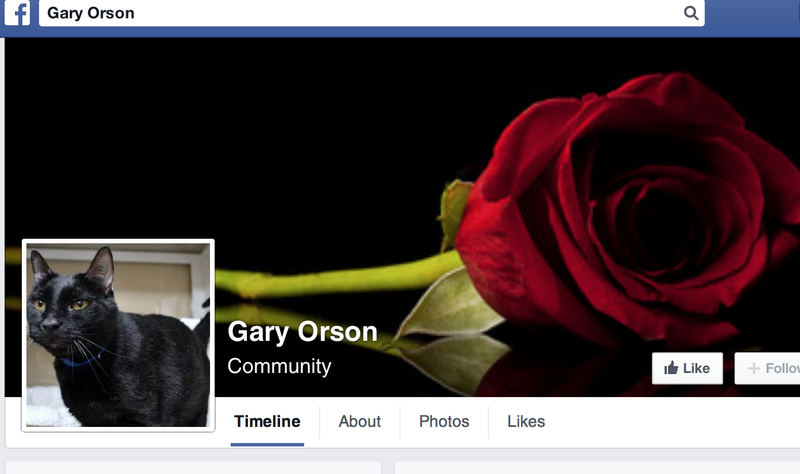 The link to Gary's Facebook page is missing the e in loveable, so it's broken. But I found it anyway - and I see he is interviewing a potential human tonight! Awesome! THANKS Sparkle, for catching that! It's fixed now (we hope)! He is a cutie (mum says!) Hehe! Oh, if he's interviewing a human tonight we'll keep our paws crossed for him! Oh my, you are so right, he is one deserving handsome dude! Awww... Gary's a stud!!! What a romantic mancat! You've got that suave Clooney look that's for sure! He's such a loverkitty! We hope he won't have long to wait for his furrever family!